Restaurant: 6:30 am - 10:00 pm. Parking is included when you dine with us at the apron. Upon arrival, please check-in with front desk or your server. 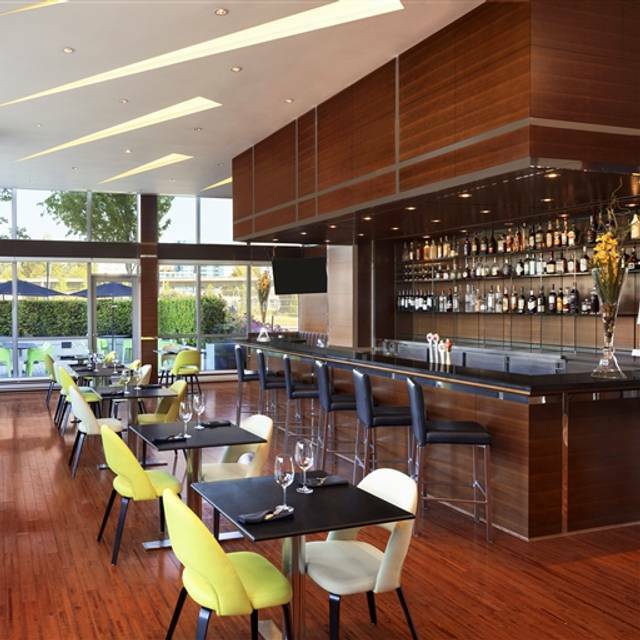 Relax and unwind in our modern restaurant featuring two big screen televisions, and an outdoor patio. the apron, will leave you feeling well-nourished with a menu that spans wholesome SuperFoodsRx™ and contemporary Pacific Northwest cuisine. Rise and shine with something fresh from our breakfast menu, or sit down for a succulent dinner in our elegant dining room. Stay late and relax with friends and colleagues over cocktails or a selection from our extensive wine list in our cozy, intimate lounge. It's a quiet spot for a business meeting which is why I was there . We were there around 10:30am, seated quickly and served water and coffee right away. The food unfortunately was disappointing. I ordered the broccoli spinach frittata and there was no broccoli. It would also be good to have a better description that the potatoes are mixed into the frittata. 'Fingerling potatoes' to me implies they are on the side. My guest ordered the Wall Centre Breakfast, and it's the worst Ive seen. The hashbrowns were dry and looked 3 days old. So did the sausage, dried, shriveled and so unappealing. It was nice food and great service. But drinks are bit pricy side. We all had a great brunch and complimentary desert for birthday girl. Great service by our server Scott! Lovely breakfast and free parking for restaurant guests if you leave your license plate with the front desk. Patio will be great in the summer time! We had a delicious dinner for two and drinks prior to our flight to aisa the next day. Food was very nice and the service was excellent. There’s been a mix-up with our table we arrived 10 min early and our table is not yet set-up but our very attentive waiter made up for it. First time at this resto & with the 4.5 stars compared to a 4 at Tramonto we were expecting a bit more the ambiance is disappointing and the place is like a bar more than a restaurant and the view is non existent just walls all around maybe that’s why it’s called “wall centre” JK. Great food. Looks like a casual dining experience but the food and service was excellent! We went on Christmas Eve and ordered their Christmas 3-course menu. The service was terrific, very friendly and attentive. The food was mostly great and well presented. The only part of it that was a bit lackluster to me was the desserts. The chocolate lava cake and pear tart both werent warm enough. Overall though, it was a really pleasant experience and we had a lovely dinner. Food was great as usual. Service by Terrence was fantastic. I ask for him when I make a reservation! The reception not aware we have booked via Open Table. Waitress not familiar with menu. Serving time is way too long. Brewed coffee is stale. Overall the food and service was really good. The only thing is the cleanliness as I noticed there were many fruit flies flying around the restaurant. One fell into my glass of wine which was very disturbing. Although the server took it off our bill, but it made me wonder about the cleanliness inside the kitchen as well. Tucked away in the corner of Richmond near the airport, the restaurant itself was not crowded at all on a Friday night (even though the hotel lobby was quite busy.) The food did not justify the price point, however. The sous vide pork was overcooked and was not tender at all, but the pork belly was nicely done. Everything on the Salmon dish was too salty. The dessert was alright but not to a point that changed our minds about the place. The breakfast is awesome! Orange juice is fresh and reasonable price. Went dinner on saturday, the server/waiter guy he was excellent.. The service we were provided by the Asian waitress was outstanding. Extremely friendly waitress who went above and beyond as she prepared us a special dessert as we were celebrating our anniversary. Even the general manager stopped by to congratulate us. Food was quite tasty and serving amount was generous. We ordered the spicy Korean wings as an appetizer and got 13 pieces. Definitely wasn't expecting that much. Quiet and off the beat location so a great hidden gem, although the restaurant itself isn't very large. Went with my husband for date night. Went cause reviews were good. Ceased salad so bland worse than white spot. Pasta ok but seafood over cooked. Halibut over cooked as well. Service was good. Cost way too high for quality. Very disappointed . Great food, good portion, very good service. Will come back for the quiet ambience. It's very quiet, excellent for privacy meeting. Service is exceptional. We had ordered the duck prosciutto, the halibut with the green curry sauce and the lamb. The prosciutto was good paired with the arugula and goat cheese. The halibut was the star of our meal. It was prepared perfectly and wasn't overdone at all. We really enjoyed the sauce paired with the sticky rice. The lamb was good but like another reviewer said the fat could've been rendered further. Service was a bit slow, likely because there was a bigger party that got seated after us. Overall though it wasnt very busy or nosy. Would return again for a date night. Compared to other restaurants in Richmond this restaurant is off the main stretch of No. 3 Road, not well advertised and located at the back of the main floor of the Wall Centre Airport. Its certainly small at 67 seats but once you are settled in its a nice atmosphere where you can have a quiet conversation and wind-down. We tried the tuna carppaccio and duck prosciutto for appetizers, both well-presented and tastefully prepared. Pease note that bread or a bread basket is not complimentary or provided. Like other reviewers we opted for the halibut and lamb chops for our mains. They did not disappoint and unlike some other reviewers we found the entrée portions to be generous for the price. The halibut was slightly over cooked but came with sticky rice that had a nice coconut aroma and infused with chunks of mango. It was an interesting touch to see the sticky rice served in a separate bowl from the halibut entrée. The 2 lamb chops were generous cuts cooked to medium rare and served with hotel quality veggies and buttery smooth whipped potatoes. While this was not the most memorable dinner the execution was solid and the service pace friendly but not swift. Overall, the entrees are the stars of this establishment. We opted a couple of coffees, 1 soft drink, 2 appetizers and 2 mains. Final tab including tax was about $117. A good place and it will be free parkibg when go ask for the parking pass at the counter. But don't understand why would the restaurant will only have one waiter for the whole evening time to serve the whole restaurant. Actually we can leave restaurant more early then we expect. We finish food around 8:30 but can't leave until 9:30pm because the waiter always busy that he can't get out bill. Also, I would like to said the main dishes is good and worth for the price but not the appetitsor. Restaurant wasn't busy, was only table at the time (6:30p on Wednesday); food was alright but not memorable- wife had the lamb dish but the fat was not rendered enough, hence was tough to cut and eat. Seafood linguine was ok.